Cignal AI provides active and insightful market research for the networking component and equipment market as well as its end customers. Our work blends expertise from a variety of disciplines to offer a unique, informed perspective on the continuous evolution of networking communications, and includes both quantitative and qualitative analysis of the technology markets. Cignal AI provides reporting on Optical Hardware, Optical Hardware Applications, and Optical Customer Markets on a quarterly and annual subscription basis. Cignal AI clients subscribed to one or more of our market reports receive Active Insight news service as a benefit, free of charge, during their subscription term. Cignal AI presents the results from the 4Q18 Optical Customer Markets Report. Cignal AI presents the results from the 4Q18 Optical Applications Report. The next major stop on the road to faster speeds in the datacenter is 400Gbps Ethernet, and activity at OFC2019 centered on making this speed a feasible commercial option. Cignal AI’s 2Q18 Optical Hardware Applications Report has been issued. Cignal AI’s 1Q18 Optical Hardware Applications Report has been issued. Its arrival marks the first quarterly release of this report, which will now be standard practice; previously the report was published every six months. Cignal AI has issued the 2Q18 Optical Customer Markets Report. The compact modular format continues to be the fastest growing segment of the optical hardware market. In this section, the announcements and demonstrations at OFC are detailed. 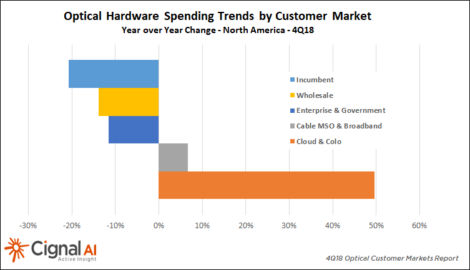 Cloud operator spending on optical hardware grew almost 50 percent year-over-year to reach well over over $1 billion in 2018, according to the most recent (4Q18) Optical Customer Markets Report from research firm Cignal AI. Before OFC, Acacia highlighted progress towards bringing the AC1200 optical module and Pico DSP to production with customer field trials of its components in Adva and Cisco equipment. Cisco mentioned multi-haul, our concept of a coherent link that is capable of operating across a wide range of speeds and distance, in a blog detailing the results of a trial with Verizon of their new NCS1004 platform. Ciena announced its latest generation of coherent technology with a dual strategy of pushing coherent speeds to 800Gbs as well as delivering low power pluggable 400ZR solutions.